Last night, Your Humble Narrator saw Belle & Sebastian at the Dome in Brighton. The gig was excellent; as impressive as the Melbourne one*. 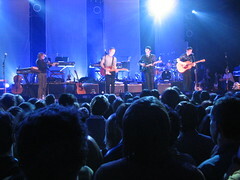 They played a mixture of old and new songs, starting off the gig with Stars Of Track And Field. Stuart was particularly animated; other than dancing energetically, during a performance of Electronic Renaissance, he took to the railing that encircles the general-admission area of the Dome and did a circuit of it, singing into a wireless microphone. The audience was divided between those who turned to follow him, and those who watched the rest of the band on stage, including Stevie also singing. The version of Your Cover's Blown was also very groovy, and they did an impromptu live version of The Strokes' Last Night, which, whilst lacking somewhat in accuracy, more than made up for it in spirit. I managed to get a camera into the venue, and took some photos. Alas, my batteries soon ran out (a pox on Canon's battery life indicator, which has only two settings: "everything's OK" and "about to die"). I took the remainder of the photos with my cameraphone, which turned out better than one would expect from a phone, though nowhere near proper camera quality. The photos are/will be here. * except that the girl they got on stage for the encore didn't know the words to any songs, and stood there like a somewhat inebriated deer caught in headlights, singing the few fragments of The State I'm In she could remember. It was alright, though; the audience joined in to help her.